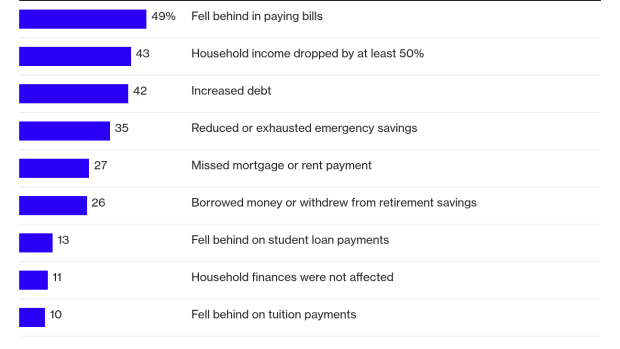 (Bloomberg) -- Unpaid mortgages, burned savings, food bank visits -- those were some of the consequences for workers during the longest U.S. government shutdown that ended last month, according to Prudential Financial Inc.
More than a quarter of federal employees missed a mortgage or rent payment during the shutdown, while 49 percent fell behind on bills in general, according to the Prudential survey of 352 federal workers, contractors and spouses. Even though government workers are more likely to have emergency savings compared with the general public, many depleted most or all of that cushion, the poll showed. The survey by Prudential, the second-largest U.S. life insurer, is timely: Negotiators in Washington who are trying to avert yet another shutdown ahead of a deadline this week are awaiting word on whether President Donald Trump will approve a tentative deal. More than 40 percent of households affected by the shutdown increased debt, while 26 percent dipped into retirement savings. Almost 40 percent of respondents delayed vacations or major purchases, while 33 percent took on temporary work. A quarter of workers used a food bank and 23 percent cut medical spending. The impact may be lasting: “When they miss their payment or when they postpone their health, they not only get sicker, but they affect their credit scores as well, so that future borrowing is going to be more expensive,” Kalamarides said.